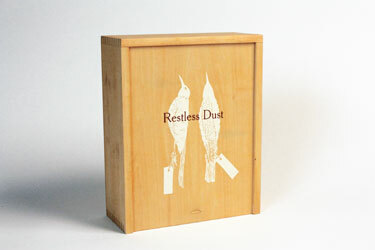 Artist/author Gail Wight created Restless Dust as a multimedia installation housed in a two-tiered wooden box. 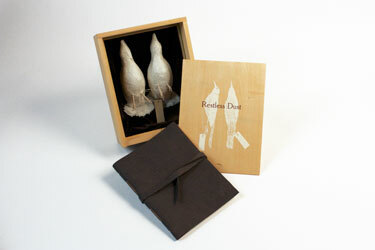 The top portion holds a three color, letterpress printed, leather bound artist's book which is separated by Plexiglas from a velvet-lined bottom chamber containing two illuminated paper birds (activated when the box lid is removed). The custom made cigar style box was stained and silkscreened for the final piece. Wight's text invites Charles Darwin's ghost to sail to present day San Francisco and wander with the artist through the diverse Bay Area terrain. The focus of the journey is three-fold: to celebrate Northern California's unique species; to examine Darwin's legacy and its impact in the Bay Area and to acknowledge the fragile and endangered state of local flora and fauna caused by environmental degradation. 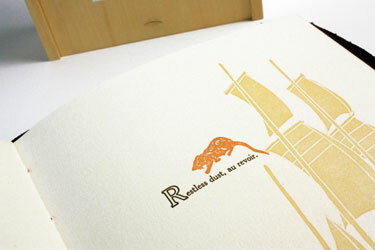 The artist carved and printed the book's images from linoleum blocks and hand-set the body text entirely in metal type. In her own words: "In attempts to understand life, I have: made maps of various nervous systems, practiced art while under hypnosis, conducted biochemical experiments on myself and willing others, executed medical illustrations in black velvet, documented dissections of humans, dissected machines and failed to put most of them back together, removed my teeth to model information systems, translated EEGs into music, painted with slime mold, made music with mice, drawings with bones, and have attempted to create models of my own confused state. The interplay between art and biology, theories of evolution, cognition and the animal state-of-being form the groundwork for my thoughts. In what ways do we resemble worms? Is a machine more or less reliable due to its lack of endorphins, emotions, and opiate addictions? 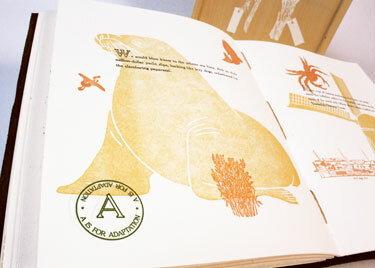 Can an artist collaborate with other species? What does compassion look like at the neuroanatomical level? 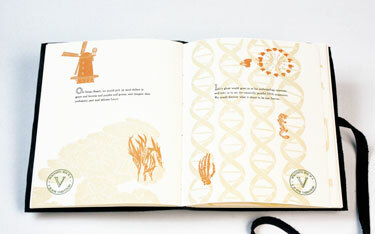 My artwork investigates issues in biology and the history of science and technology. It explores the cultural impact of scientific practice, and our ongoing redefinition of self through epistemological constructions. I try to follow the ways in which these ideologies both metaphysical and manifest travel through time, moving from the scientific to the social sphere, the social to the scientific, and so often become the overlooked of the everyday."